Moudhy Al-Rashid specialises in researching Ancient North Arabian inscriptions from the Arabian Peninsula, including those written in Taymanitic, Dadanitic, Thamudic B, Thamudic C, Thamudic D, Nabataean, Imperial Aramaic, and Old Arabic. In particular, she is interested in the interaction of the Assyrian and Babylonian civilisations of ancient Iraq and Syria with the civilisations and populations of the Arabian Peninsula during the first millennium BCE. Her background is in Assyriology, where she specialises in the first millennium BCE. She completed her doctorate at the University of Oxford (Wolfson College) in 2014. 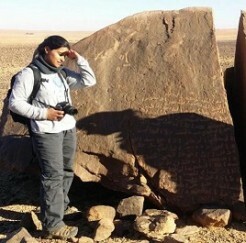 While at Oxford, Moudhy also worked for “Epigraphy and Ancient Landscape in the Hinterland of Tayma”, a collaboration of the University of Oxford, the DAI, King Saud University, Deutsches Archäologisches Institut, and the Saudi Commission for Tourism and National Heritage (SCTH) which surveyed and researched inscriptions in the areas surrounding the oasis of Tayma in the northwest of Saudi Arabia. Moudhy is currently a Junior Research Fellow in the Social Sciences and Humanities at Wolfson College.